World timer watches have a 24-hour ring that makes one revolution in 24 hours, and a cities ring that can be adjusted from the crown or using a pusher in order to set the time zone corresponding to the hour and minute hands. At this point, at a glance you can see the time, and day or night status, for each of the 24 whole-hour time zones. It’s a distinctive complication, with not many contenders: it is the territory of the great watch brands who do everything in-house such as Patek Philippe, Vacheron Constantin and Jaeger-LeCoultre. I think that if 2017 was the year of the moon phase complication, 2018 will see some new arrivals amongst the world timers. 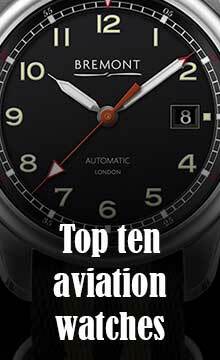 Here is a selection of the top ten world timer watches available on the market today. In ascending price order. Published 21 November 2017, last updated 10 March 2018. In 1953, Tissot brought out a watch that incorporated a brilliant intuition: you can make a world time watch using a movement used for a simple GMT display – usually a hand on a 24-hour scale – by replacing the 24-hour GMT hand with the city ring. The city ring rotates once every 24 hours and so shows the approximate time anywhere in the world. 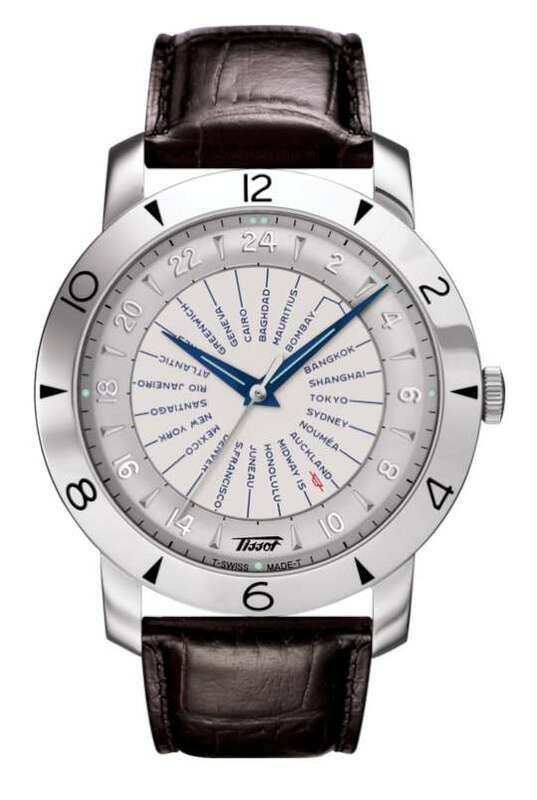 In 2013 the brand released the Tissot Heritage Navigator 160th Anniversary as a limited edition, and there is still a limited availability on the Tissot website. The city ring is adjusted from the crown. The major difference between this watch and the classier world time watches further down this page is that there is no way of rapidly changing local time when you change time zones. You simply set the city ring at one crown setting, and the local time at another. The local time is read off the non-rotating bezel. The watch is large at 43 mm diameter, slim at 10 mm, water resistance 3 bar, and it has a sapphire caseback that displays the ETA 2893-3 movement. The calibre is self-winding, running at 4 Hertz, with a power reserve of 46 hours. It is COSC chronometer-certified. The watch, reference T078.641.16.037.00, costs €1,470. More info on the Tissot website. The Ball Trainmaster Worldtime is similar to the Tissot Heritage 160th Anniversary in that it is a modified GMT watch, but unlike the Tissot, the appearance of the Ball watch is wholly analogous to the most advanced and complex world time watches listed further down this page. The watch is powered by the Ball RR1501-C calibre, which is basically the ETA 2836-2 that has been modified, adding a 24-hour output that in this piece is used to drive the 24-hour world time ring. The 24-hour display and the local time are adjusted separately using different positions of the crown. The movement is chronometer-certified by COSC. The hour and minute hands, and hour markers, are luminous, with light provided by micro gas tubes, powered by H3 (tritium), producing light that is initially 100 times more intense than SuperLuminova, with a lifetime of 25 years. The case is 41 mm in diameter and – considering the dial design – fairly slim at 12.5 mm. Water resistance is 5 bar, 50 metres. 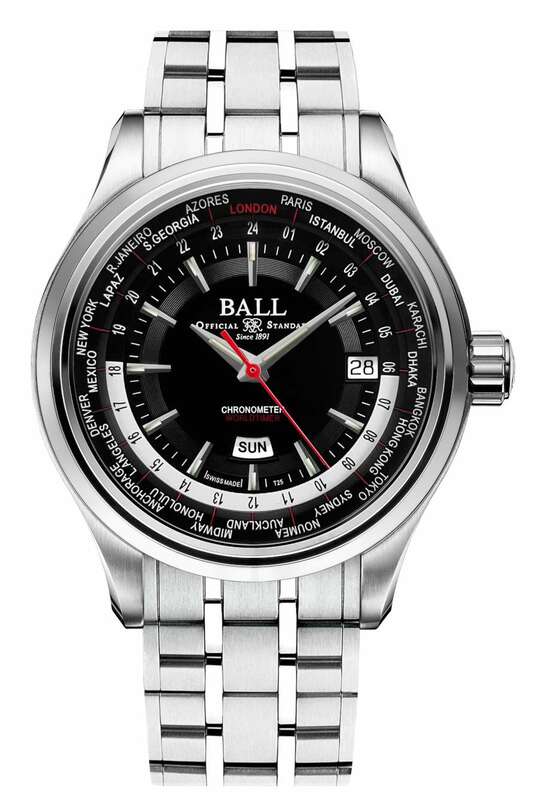 The Ball Trainmaster Worldtime has an export price of 2,350 Swiss francs, €2,100. Read more here. This watch has a case is in rose-gold-plated stainless steel, 42 mm in diameter and 12 mm thick. The dial has a decorative world map at the centre, with the hour markers around it. Then comes the 24-hour ring with its day and night sectors, and lastly the city ring that can be rotated from the crown in order to set the time zone of the time shown by the hands. All settings are made using the crown, which eliminates the pusher that is usually used for changing the time-zone. The dial is designed with a subdial for the date which obscures the reading of the time in a few zones. The movement is the self-winding FC-718 calibre, made in-house, visible through the sapphire caseback. The best thing about the Frederique Constant Manufacture WorldTimer is its price. At €3,795 it costs far less than the classic versions by Patek Philippe and Vacheron Constantin. There are versions in stainless steel with bracelet or leather strap at €3,195. Read more here. Montblanc launched this watch at SIHH in 2015, and it caused quite a stir, as a cool complication at a relatively low price, around €5,000. It is 41 mm in diameter and 12 mm thick, with a stainless steel case, water resistance 3 bar, and the pusher at 8 o’clock adjusts the city ring. The home time city is displayed at 6 o’clock. 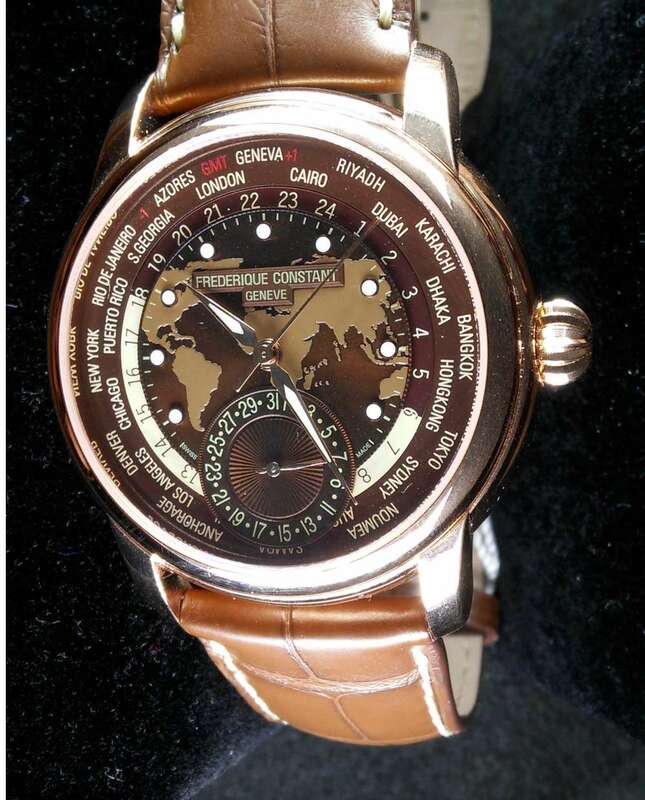 This is the lowest-priced world time watch to have a functional world map. It provides a day/night display by means of two sapphire discs, one light blue and one dark blue. Other distinctive characteristics of this watch are the lack of a second hand, an unusual design choice, and the very minimal minute indications right at the edge of the dial. The watch is powered by the self-winding Montblanc MB29.20 calibre, which is made using a third-party movement (Sellita) to which an in-house module has been added. It provides 42 hours’ power reserve. There are now several different versions, with different maps (China, Europe), a gold version at €16,000, and a new version with a more colourful map (€5,000). 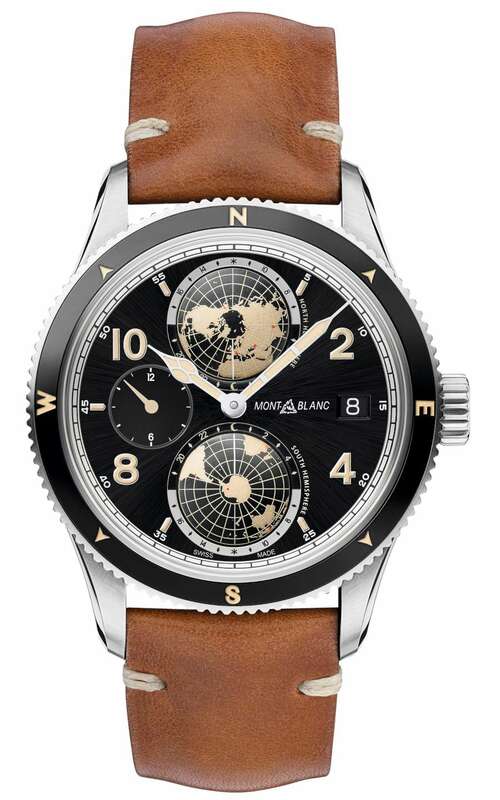 Read more on the Montblanc website. 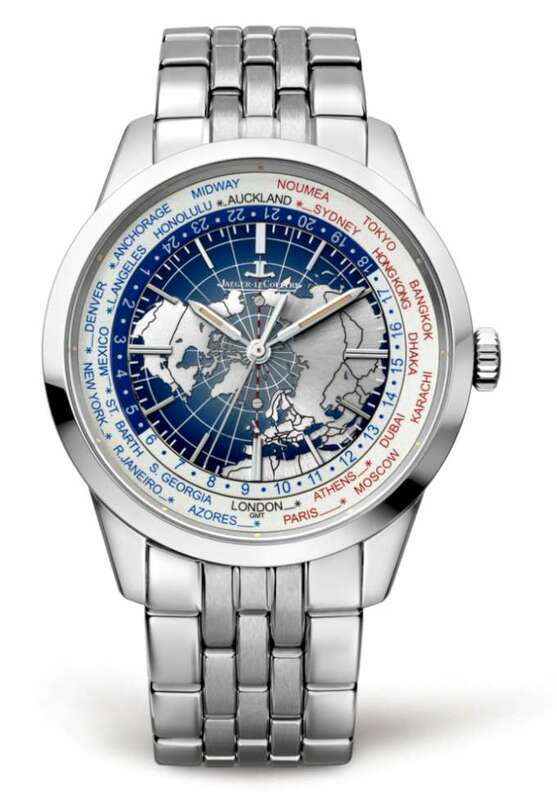 The 1858 Geosphere is an interesting watch, featuring a world time display with two rotating hemispheres. It is probably the most democratic world timer watch of all, because it includes both the hemispheres, and its price, from €5,190, is also comparatively accessible. The two hemispheres are given a touch of three-dimensionality as they are slightly domed, and they rotate once every 24 hours, the northern hemisphere at the top of the dial turning anticlockwise, the southern hemisphere turning clockwise. They are surrounded by a reference scale that includes day/night sectors, but as there are no indications for cities, you just get a general idea of the time in any particular location. Read more here. Breitling is a brand famous for its chronographs and so the Transocean Chronograph Unitime combines a chronograph with the world time function. The chronograph functions are clearly displayed, though the fractional seconds scale is interrupted at every hour by a small rectangle of SuperLuminova. The date is clearly legible though I always find that a diagonally-positioned date at 4.30 is a less than optimal compromise. The case is in steel or red gold, very large at 46 mm diameter, 15.4 mm thick. The double-gasket crown contributes to a commendable water resistance of 10 bar, 100 metres, even though it is not screw-in. The caseback is solid, and the watch is available with several strap options, the attractive Milanaise “Ocean Classic” shown in the photo below, or leather, rubber or canvas straps. The movement is the in-house self-winding Breitling B05 which runs in 56 jewels, at 4 Hertz, with a power reserve of 70 hours, COSC chronometer-certified. It is based on the brand’s signature B01 chronograph movement, and so, like this, it is the most prestigious type of chronograph calibre, with column wheel and vertical clutch. Once you have set up the watch for a particular time zone – shown by the city at 12 o’clock – it is easy to adjust the watch when travelling. Turning the crown simultaneously adjusts the hour hand, the city disc, and the 24-hour disc, with automatic date adjustment. The stainless steel version costs €10,600, the red gold version costs €27,140. 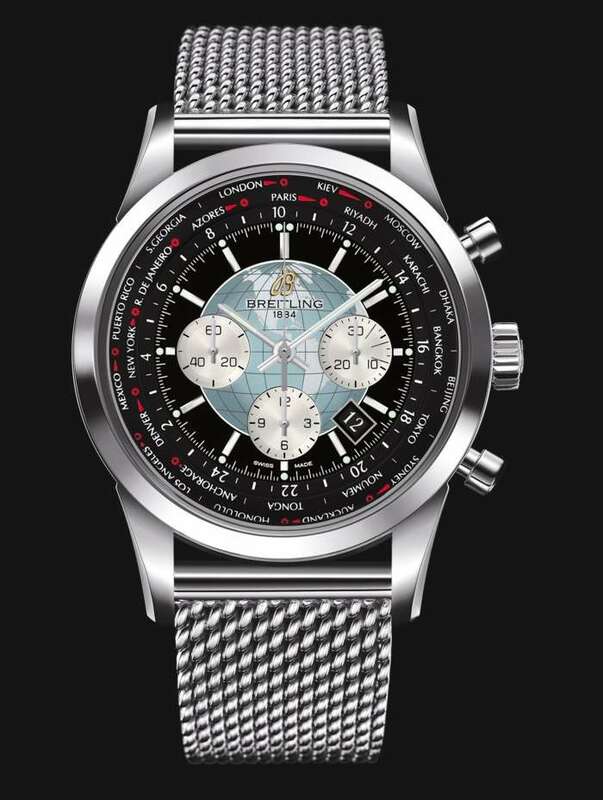 Read more on the Breitling website. 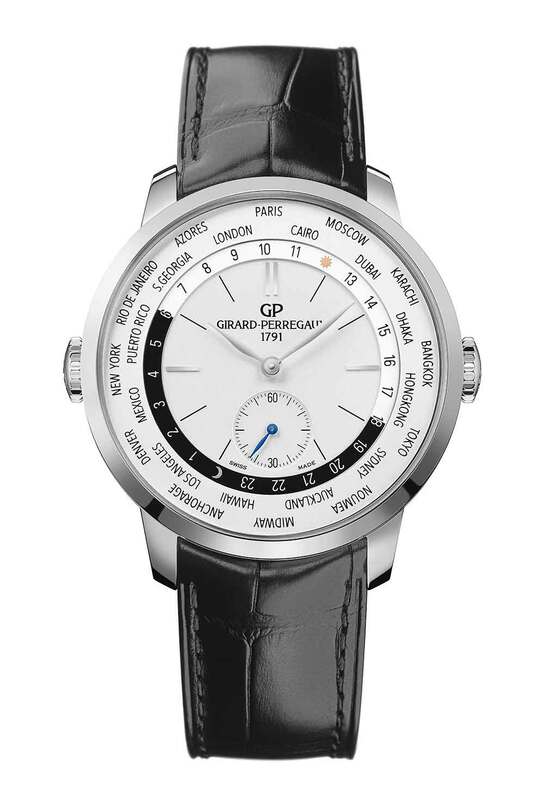 The new Girard-Perregaux 1966 WW.TC – World-Wide Time Control – has been completely redesigned. It’s simple to use. The crown at 9 o’clock is used to set up the watch for the time zone you’re in by rotating the city ring at the outer edge of the dial. The crown at 3 o’clock is used to adjust hours and minutes, and the 24-hour ring follows this automatically. Both the city ring and the time can be adjusted forwards and backwards. It’s a compact watch at 40 mm diameter and 12 mm thickness, water resistance 3 bar. It is powered by the in-house self-winding GP03300-0022/0027 movement, based on the GP03300, which is very slim at 3.2 mm, leaving lots of space to put on an additional module for the world time complication. The balance runs at 28,800 vibrations per hour, 4 Hertz. Its unidirectional winding system creates a faintly audible noise and feel that has become a feature appreciated by wearers. In pink gold the watch costs 24,200 Swiss francs, in steel with alligator leather strap 12,500 Swiss francs, and steel with a steel bracelet, 13,200 Swiss francs. Read more here. 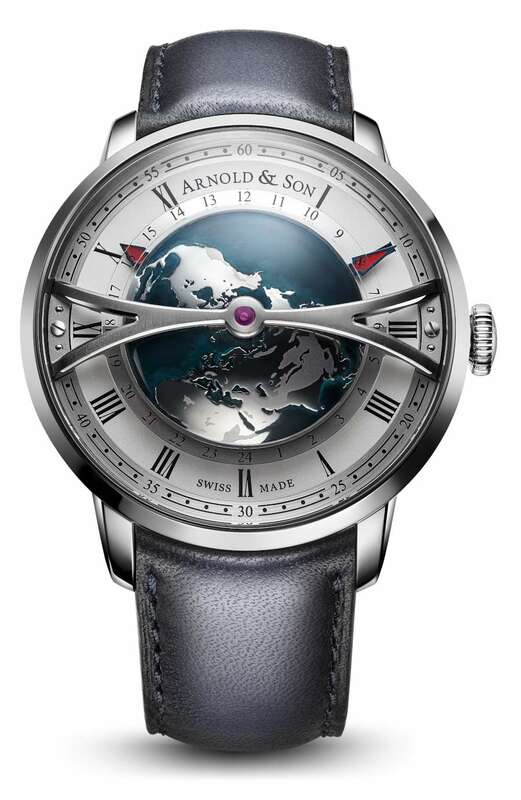 The Arnold & Son Globetrotter is an intuitive version of the world timer function, with a central hemispherical depiction of the world seen from above the North Pole at the centre, and a 24-hour disk rotating around it. The dial is dominated by an arching bridge, and the brand’s reference figure John Arnold is suggested by the marine chronometer-style hour markings in Roman numerals. Read more here. Jaeger-LeCoultre’s Polaris Chronograph WT is a fantastic watch, large at 44 mm, but it wears smaller, it’s only 12.5 mm thick, and light for the use of titanium. 100 metres water resistance makes it a great all-weather watch. The chronograph has a column wheel and vertical clutch, and the world time function is easy to use. The external cities ring is controlled by the crown at 10 o’clock. It shows the conventional 24 time zones, with lines and triangles indicating summer time in the respective cities. Inside this ring, the 24-hour ring then enables you to immediately see the time in any other time zone. A neat and unusual feature is the indicator linked to the 24-hour ring that enables you to set up the watch with precision, aligning the hour hand with this needle running across the face of the watch. Read more here. This watch was introduced in 2012 and now seems to be out of production. It was an interesting watch as it combines a chronograph – based on the brand’s classic high-beat El Primero movement – with the alarm function and a world time display. The “Doublematic” of the name describes the construction with dual mainspring barrels, one for the alarm function and one for timekeeping. The alarm mainspring has its own power reserve indicator. The alarm is operated by means of the crown at 8 o’clock, with a pusher for activation and deactivation, and a skeletonized red hand on the dial showing the alarm time. 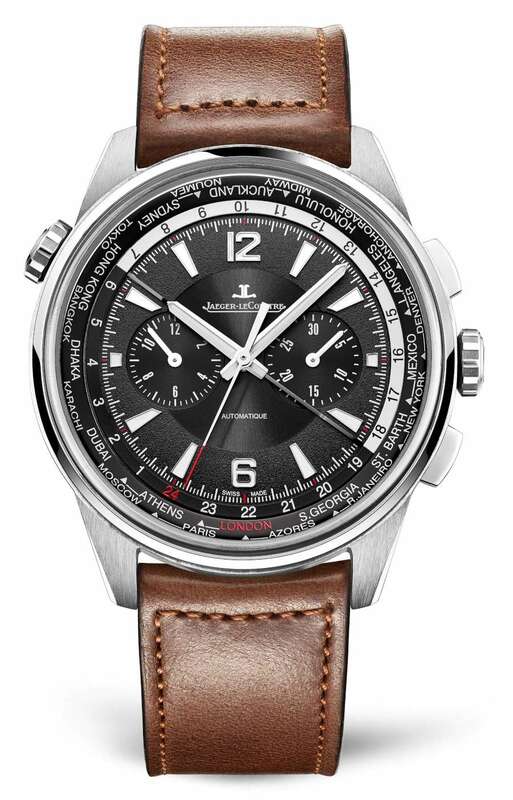 The chronograph has a 30 minute counter, and a chronograph seconds hand that is read off a complete scale. The world timer city ring is adjusted by the crown at 10 o’clock. It is a large watch at 43 mm diameter, 15.6 mm thick, water resistance 5 atm. Price €15,200 for the steel version (reference 03.2400.4046/21.C721), and about €23,900 for the rose gold version (reference 18.2400.4046/01.C721). 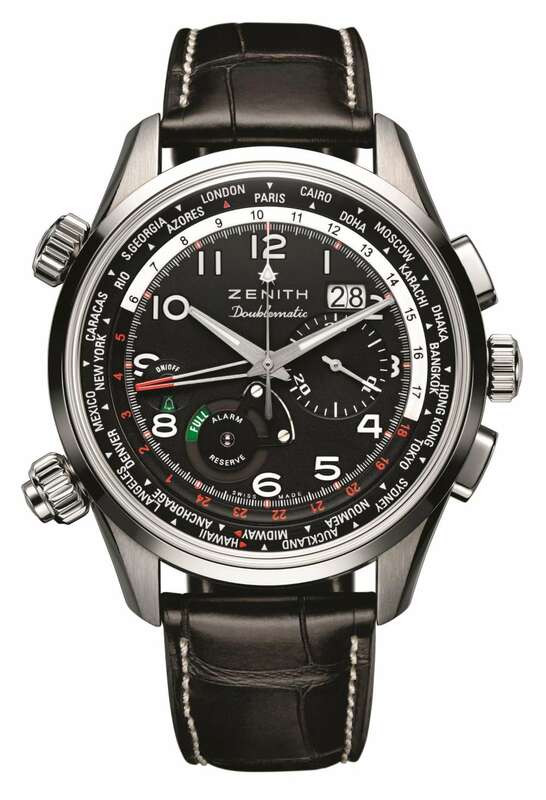 The watch seems to be available on some discount websites though it is no longer on the Zenith website. The Geophysic Universal Time, introduced in 2015, is in stainless steel, 41.6 mm in diameter and 11.84 mm thick, water resistance 5 bar. It combines two complications, world time, and true seconds, probably the only such watch. The Jaeger-LeCoultre calibre 772 movement is self-winding, running at 4 Hertz, 40 hours’ power reserve. It is based on the brand’s true-beat calibre 770. 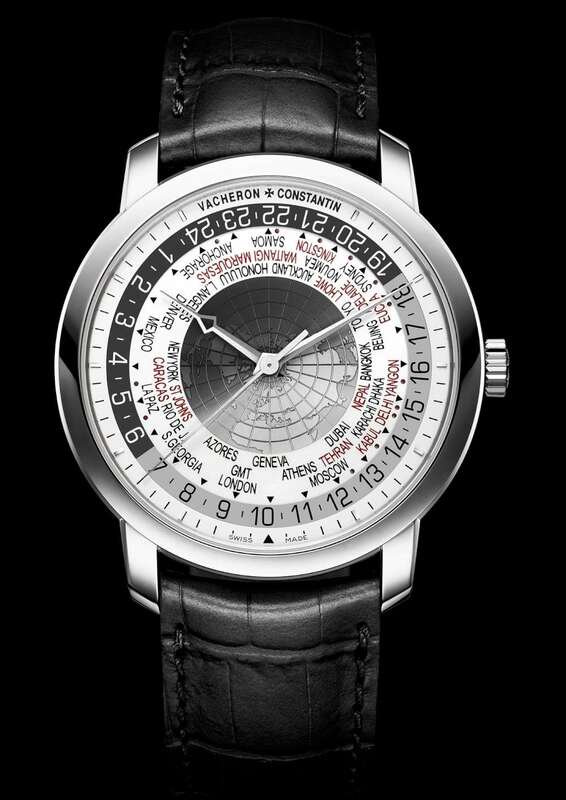 The map at the centre of the watch is purely decorative, and it is overlaid with the hour markers and the divisions for seconds and minutes, and a vertical line in red and white that corresponds to the Greenwich meridian. There are also two exposed screws on this line. All settings are performed using the crown, with which the hour hand can be moved forwards and back independently of minutes and seconds, useful when crossing time zones. This watch is reference 8108420, and it costs €16,400. Read more on the Jaeger-LeCoultre website. Vacheron Constantin’s Overseas World Time is exceptional for its completeness. It includes all 37 time zones, including the half-hour or quarter-hour zones. Everything is clearly legible and the small triangles and dots on the edge of the city ring provide a precise reference for reading the time in the various time zones. 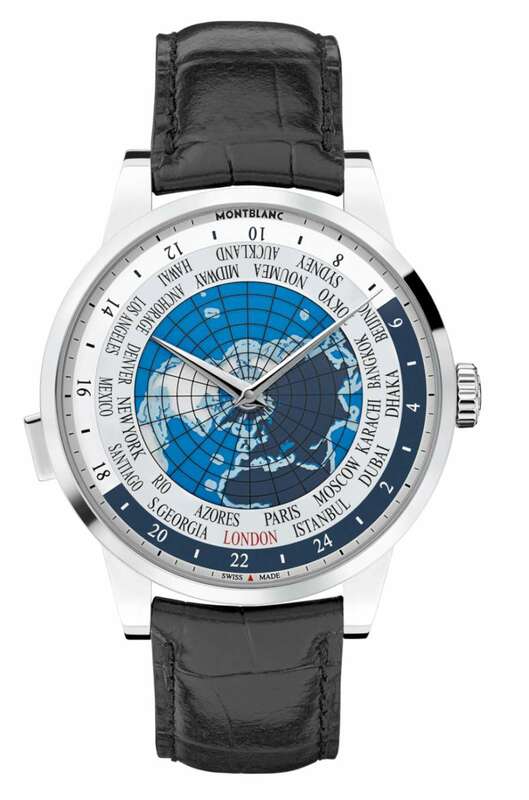 The central map, the continents seen from above the north pole, is functional, with a sapphire disc indicating day/night status by means of smoked tints, rotating along with the 24-hour disc. All of the world time indications are set from the crown. The watch is large at 43.5 mm diameter and 12.6 mm thickness, and the stainless steel case has a water resistance of 150 metres. One of the most exceptional things about the Overseas collection is the interchangeable strap. The watch is supplied with a rubber strap, an alligator leather strap, and a steel bracelet, and they can be changed easily and quickly by the user by simply pressing a lever under the lugs. 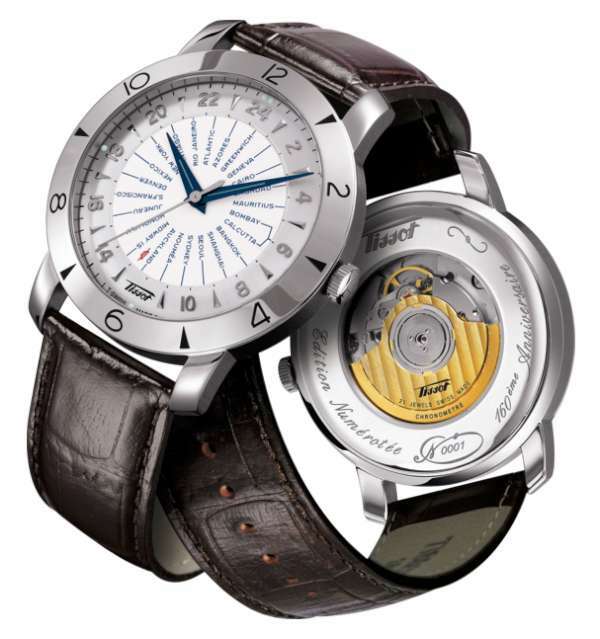 It is powered by the Calibre 2460WT, self-winding, with 40 hours power reserve. Read more on the Vacheron Constantin website. 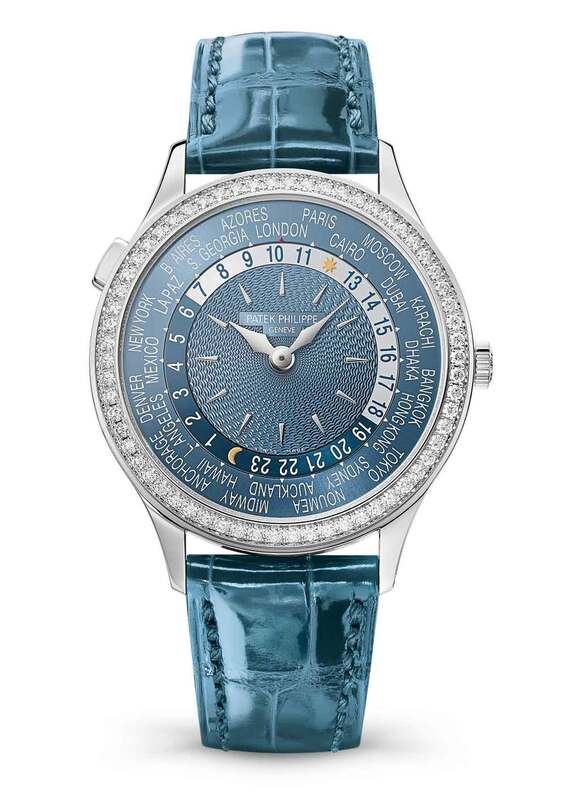 Patek Philippe’s World Time for women is a variation of a watch that is already part of the catalogue. The new version has a white gold case 36 mm in diameter, a bezel set with 62 diamonds, and a blue-grey hand-guilloché dial. The alligator strap is in peacock blue and has a prong buckle set with 27 diamonds. The watch has a display caseback revealing the calibre 240 HU movement. With every press of the pusher, the hour hand advances one hour, and the 24-hour ring and city ring move counterclockwise. The minute hand is unaffected by these regulation operations and so the watch’s precision is not diminished. A pusher is far more practical for adjustment than the crown, which is used only for setting the time and for winding if necessary. As for all of Patek Philippe’s calibres with a diameter of 20 mm or more, precision of the calibre 240 HU movement is within -3/+2 seconds deviation per day, as certified by the Patek Philippe seal. This is better than COSC specifications. The self-winding movement has 239 parts, 33 jewels, a balance running at 21,600 vibrations per hour (3 Hertz), and a power reserve of 48 hours. The movement is slim at 3.88 mm, with a gold micro-rotor. The calibre 240 HU runs at 3 Hertz, and has a silicon balance spring and balance. 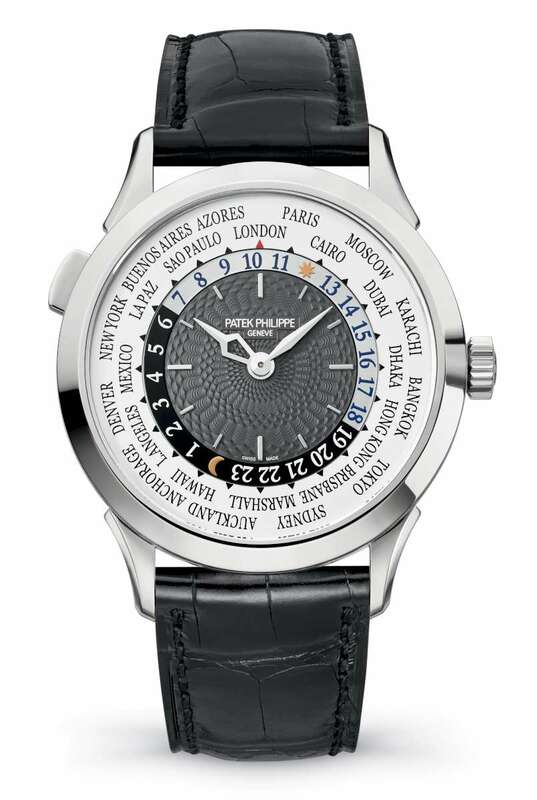 The new Patek Philippe 7130 ladies’ World Time costs $51,031, £37,040. Read more here. 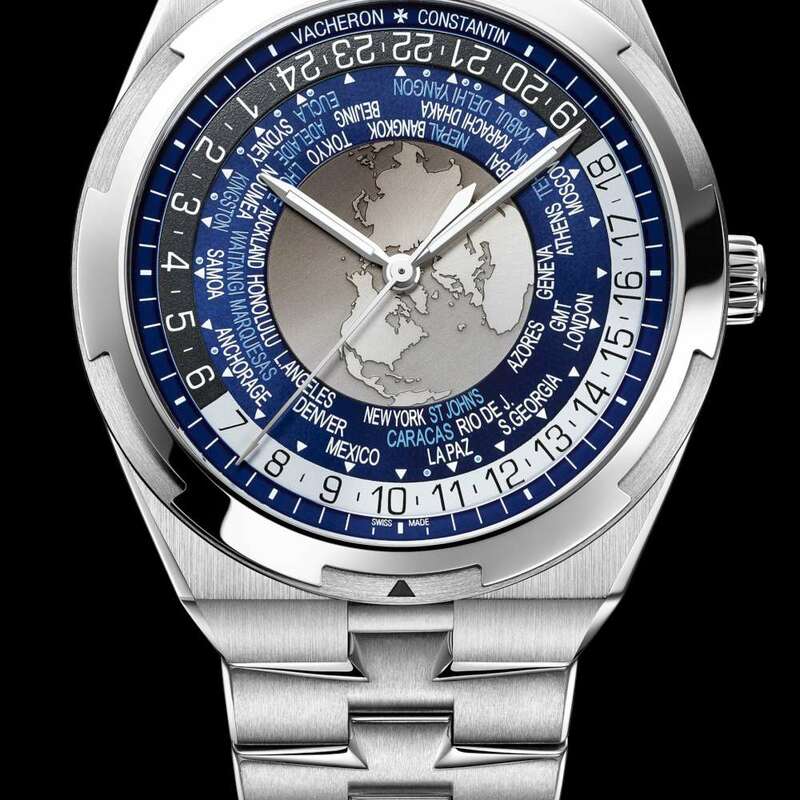 The Vacheron Constantin Traditionnelle World Time uses the same movement, Calibre 2460WT, as the Overseas World Time above, and so it includes all 37 time zones, including the half-hour or quarter-hour zones, with the same clarity of design, the same functional world map engraved in white gold with a tinted day/night indicator sapphire disc above. The case is in white gold (also available in rose gold), 43.5 mm in diameter. Read more on the Vacheron Constantin website. Patek Philippe’s World Time watch 5230 has been around for almost 80 years, and in 2016 the brand presented a new version that incorporates some changes in the cities used to designate the various time zones, such as Moscow that has moved from UTC+4 to UTC+3. At the same time, the watch was redesigned, with details such as the new-style lugs, the narrow bezel that increases the sense of space on the dial, new hour and minute hands, and the basket weave guilloché at the centre of the dial. The pusher at 10 o’clock is used to adjust the watch when you travel to a new time zone. Each push advances the hour hand by one hour, and at the same time moves the city disc counter-clockwise by one increment, and likewise the 24-hour ring by one hour counter-clockwise. The 240 HU calibre reaches a precision of -3/+2 seconds per day, better than COSC chronometer certification. Two versions of the watch are available, in white gold or rose gold, both priced €43,931. Read more here. 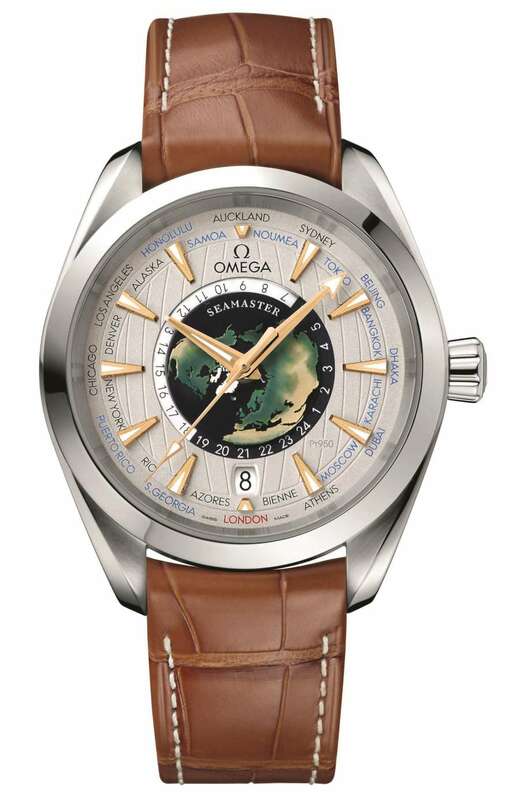 Omega’s new Seamaster Aqua Terra Worldtimer is a limited 87-piece platinum edition. From what I can see, the Omega Aqua Terra Worldtimer is the most basic form of world time watch, with a fixed cities ring, and just the 24-hour ring that revolves once a day. Its design places the 24-hour ring away from the city indications but the hour markers help you relate one scale to the other. The watch has no pushers: everything is adjusted from the crown. The watch is powered by the calibre 8939 movement, which has two mainspring barrels providing 60 hours’ power reserve, and a co-axial escapement. It should arrive in boutiques in December 2017. Price €45,800, $48,600. Read more here. 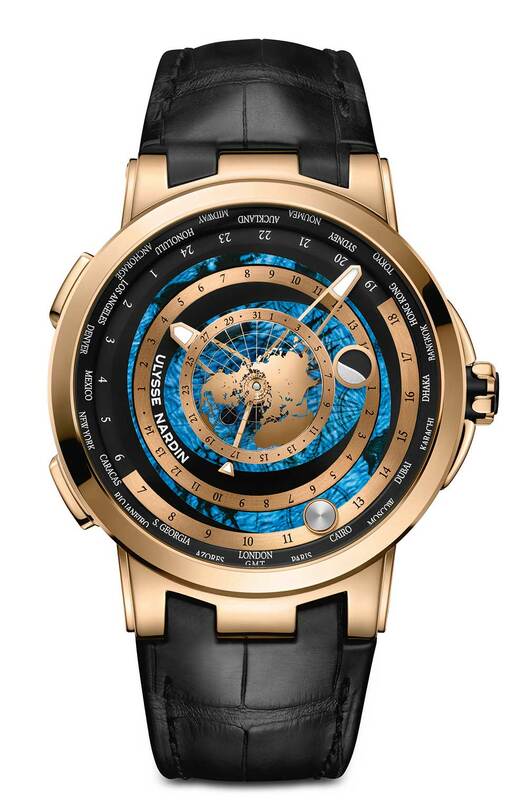 The Executive Moonstruck Worldtimer by Ulysse Nardin is a watch that combines astronomical functions with a world timer. It is in platinum or rose gold, large at 46 mm in diameter. The crown is screw-down, and water resistance is 100 metres, a nice touch for a watch that will be useful for people who sail. At the centre, the northern hemisphere is seen from above, and this remains fixed. The scale around the world map is for the date, with an arrow pointer. Then there are three concentric discs that revolve around the world map. The first bears the moon, and the second the sun. Tides are shown by a blue disc below the gold or platinum rings. The sun is borne on a ring showing the 24 hours and a day-night scale. This is used to read off the time at any of the 24 time zones. The two pushers on the left move just the hour hand backwards or forwards by one hour, a function useful for travellers when changing time zone. The self-winding UN-106 calibre was designed and built in-house, and it provides a power reserve of about 50 hours. The platinum version costs 95,000 Swiss francs; in rose gold 75,000 Swiss francs. Read more here.